Multiple sources confirming a new trailer for The Last Jedi will air tomorrow during Monday night football!! Force Awakens was the setup to the new sequel trilogy, much like New Hope was the setup to the original Star Wars. And much like in the 2nd film Empire Strikes Back, the 2nd film The Last Jedi will have a shocking twisting akin to "No, I am your father". Lucasfilms has even already promised a "shocking revelation of the past" in The Last Jedi. 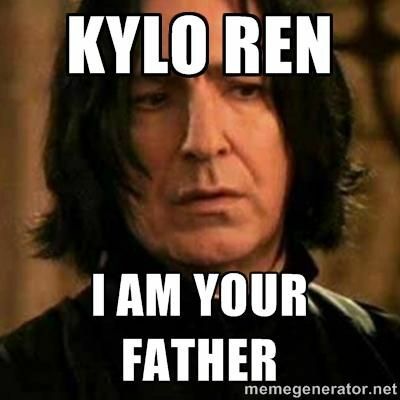 A lot of people think this twist will be finding out who Snoke is... I think that's too simple and certainly not twisty enough, but we have to answer who Snoke is regardless. To do that I think you have look back at Vader, the original unknown Sith. George Lucas's biggest clue that Vader was Luke's father was in the name Vader, which is basically a foreign spelling of the word father. Looking at the name snoke critically, it looks like an obvious combination of the words Smoke and Snake. Smoke as in a smoke screen or distraction, and snake as in lies or deceit. A snoek is also a type of fish... But not just any fish. A snoek is a herring. Like a red herring argument, snoke is a misleading distraction from what is actually going on. This is why they never revealed much about the guy. He's a deliberate farce. Even the way he appears in the first movie pays homage to Wizard of Oz. He appears as a giant scary flickering hologram.... but in the end he's just that, a fake hologram, nothing more. Once you establish that Snoke is a puppet being paraded around, the question becomes... who is the puppeteer? We know a couple of things. Whoever is controlling Snoke has to be powerful in the force. They explain that Snoke is strong in the dark side of the force, so his master or puppeteer has to be at least equally as strong. From a narrative/story-telling standpoint we know it has to be an already established character that the audience actually cares about. They can't just explain a new character with a new character. In this respect they also can't just bring back a dead character. It has to be a natural continuation of the story. Saying "it was Darth Maul the whole time! He never actually died!" would just cheapen the plot. So who is this evil dark side puppeteer that we know as a character and isn't already dead? The first clue comes in Force Awakens: "Luke Skywalker has vanished. In his absence the sinister First Order has risen from the ashes of the Empire"
So the empire is defeated, the galaxy is saved, then Luke disappears and the First Order, with a powerful new baddie sith, just conveniently comes out of nowhere? There's more going on there that hasn't been explained to us. Also why is Snoke so willing to let the map that leads to Luke Skywalker, the most powerful man in the galaxy, be destroyed? Wouldn't he rather obtain the map for himself and use his Death Star laser on the planet Luke is living on, winning the war for himself once and for all? doesn't make sense does it. Folks, the answer is Luke Skywalker has fallen to the darkside. The audience and the other characters in the plot just don't know it yet. Remember when Luke was training under master Yoda on Dagobah? Leia and Han had been captured by Vader on the cloud city. While frantically scrambling to get off Dagobah to go rescue his friends Yoda warns him not to go. That if he abandons his training now to rescue his friends he will go down the path to the darkside and it will consume his destiny. Luke foolishly doesn't listen and abandons his training. Sure enough, Luke returns to Dagobah to attempt to complete his training in Return of the Jedi, but it's too late. Yoda is kill. So now you have an extremely powerful force sensitive being, who has a history of extreme darksidedness on his fathers side, who is not trained in the ways of the jedi, heading off to kill and hopefully not be turned by the most powerful Sith Lord of all time. Yoda is an 800 year old jedi master, he doesn't just make these predictions up. 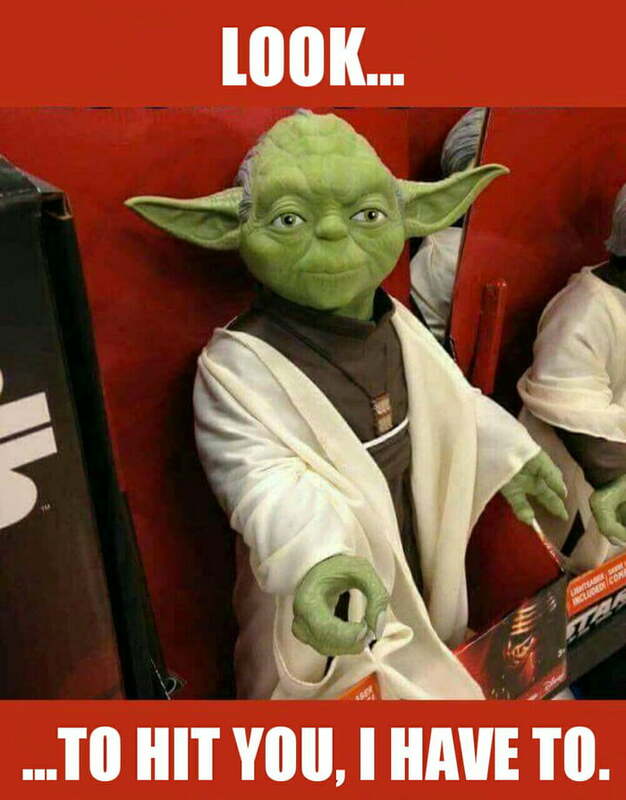 In The Last Jedi we will finally see Yoda's warning come true. We also don't know what went wrong at Luke's jedi temple. Just that something went horribly wrong and Luke took off. I would hedge my bets that he went dark, decided that Ben Solo (who shares his skywalker blood) would be his new Sith apprentice and commanded the now Kylo Ren to off the rest of the jedi students. (The Sith rule of 2 says there can only be one master and one apprentice) However he did this all through his mask: Snoke, who Kylo does not realize is Luke. 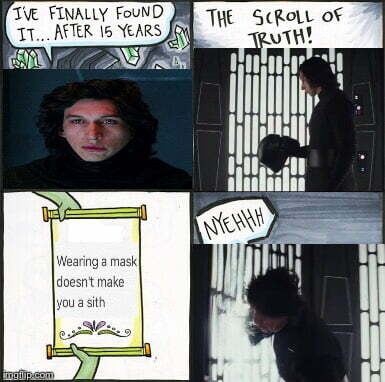 This would also explain how Kylo came into possession of Vaders burned helmet. Surely an artifact that would have been in the possession of Luke. Now, Luke will try to swap out Kylo for Rey, much like how Palpatine attempted to swap out Vader for Luke. This explains as well the title The Last Jedi. 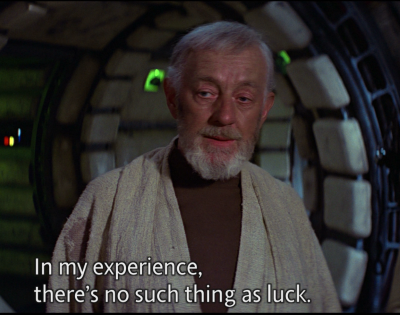 Luke was it. The last. And now he's gone. The Jedi are over. The "no, I am your father" twist flipped the whole narrative in the originals. It was no longer about simply destroying the bad guy, it was about redeeming Anakin Skywalker and bringing him back to the light. It created a villain we cared about. We are witnessing the same with Luke. He will go from hero to anti-hero/villain, which creates a bad guy that the audience actually cares about, and our good guys will go out looking for Luke not to destroy him, but to redeem him and bring him back to the light. Like his father before him. Well the trailer showed Snoke in flesh and blood. There goes my theory. Not a bad theory, though the trailer puts it to doubts. I was saying to friends Luke had gone to the dark side before the first new film because he wasn't in any of the posters or promos. Looking forward to the new film though. lol I mean, I don't know, anything could happen. I'd like to think Snoke is some sort of incarnation of Vader's dark side. because of the scar on his head and looking like a burnt victim. although, who knows, we'll have to wait and see. Don't be silly. Vaders dark side can't just take physical form. If Luke isn't darkside then the only other alternative is that Jar Jar Binks was the Sith Lord all along. 20 ft jump with somersault? That's a force user right there. If you look at Jar Jar's fighting style it's most similar to the Shaolin Drunken Fist Mushu. A martial arts style that imitates the staggering and stumbling of a drunk, but is actually extremely effective at using the bodies own momentum to deceive, lure in, and confuse opponents. Jar Jar also seems accomplished with jedi level mind control. Consider for a second, would two experienced Jedis on a serious mission actually bring someone that stupid along with them? No character that idiotic would ever really be made a general. They certainly wouldn't be made a senator. How could anyone like Jar Jar really convince the entire galaxy to abandon democracy? More dumb luck? Or the meteoric rise of a Sith trained in the way dark mind control? Lets also not forget that Palpatine and Jar Jar come from the same planet, Naboo. 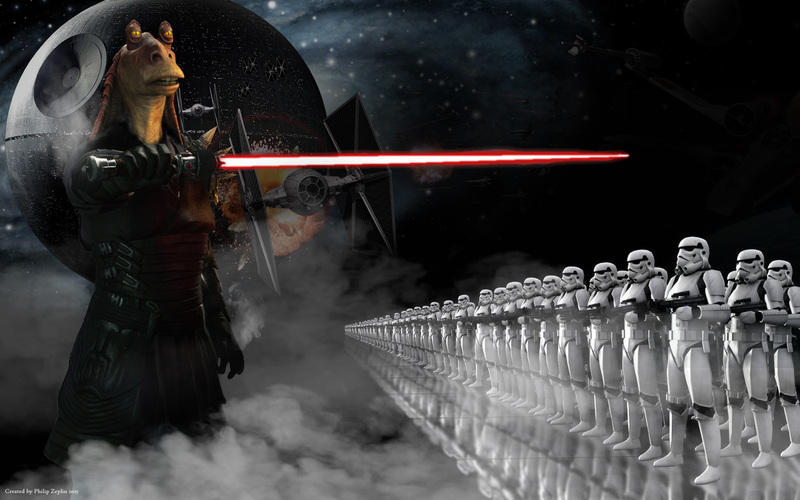 Jar Jar an outcast gungan and Palpatine an excentric force sensitive human. 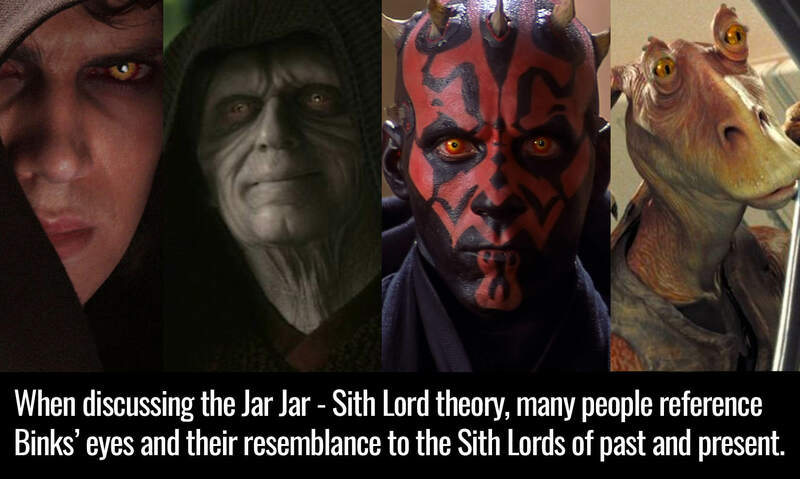 It's very possible Jar Jar discovered and trained Palpatine in the darks side at a young age, and the two worked in concert to take over the galaxy, each playing their part. Holy Sith! 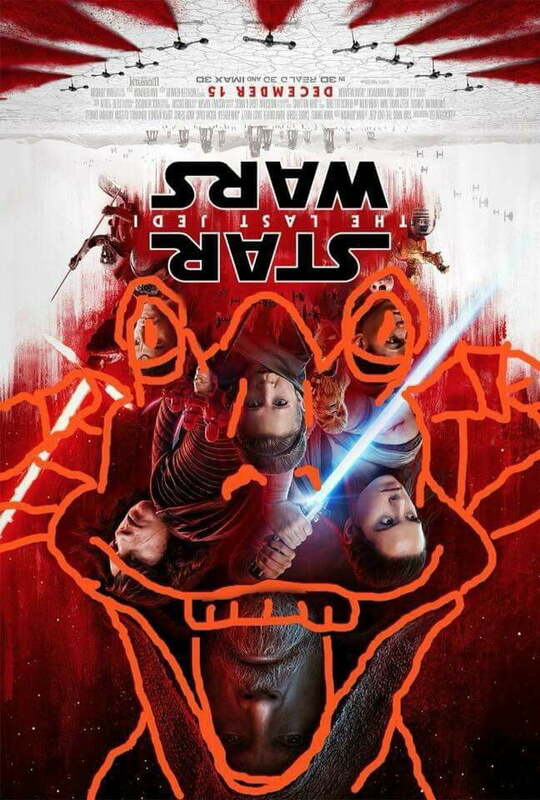 Jar Jar Theory confirmed? IT'S TIME! We're heading to the theater in about 45 minutes!! Will update upon return! Was very happy with the film and enjoyed, but i have some complaints. The Leia in outer space scene... WHAT THE ACTUAL f***... so utterly ridiculous i cringed in the theater. I have no words. Just plain bad. Also the whole SJW agenda Disney is going with is starting to wear on me. The first movie was like... a strong female lead with a black male supporting character... diversity. Cool. Nice little change up from the old star wars youre used to. 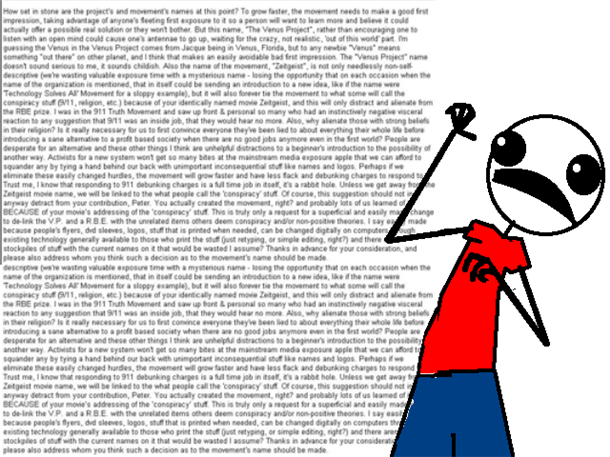 But now it seems to be going over the top. The strong female roles in this movie are already abundant, yet they introduce ANOTHER female resistance general (with purple hair no less) only to have her clash with Po Damarin and then sacrafice herself for the cause. What plot did this further?? Im less annoyed that their doing this, and more annoyed at how blatant and obvious theyre making it. Leave the weird social/political agendas out of star wars plz. Also, purple haired lady refuses to tell her captain about her plan to save them all. Why??? (Because men are idiots??) She'd rather risk mutiny at a crucial time than simply telling him she has a plan?? Idiotic. But it does serve a purpose... it allows the director to pursue an even more dumb and wasted vector: the casino subplot. The casino does nothing to further the actual plot, yet its a great platform for a forced political message: OMG THE 1% IS EVIL/WAR PROFITEERING IS BAD/SAVE THE MISTREATED ANIMALS. Then what happens after this lazy plot? Oh yeah, that hacker they picked up? He turns on them, selling them out to the first order. Recap: Because purple hair is either too dense or too stubborn, she nearly causes mutiny on her own ship and indirectly gives a hacker to the first order. What purpose did any of this serve her? None. Director created the plot hole purely so Disney could spew subtle political messages. Disgusting. Lazy. Idiotic. 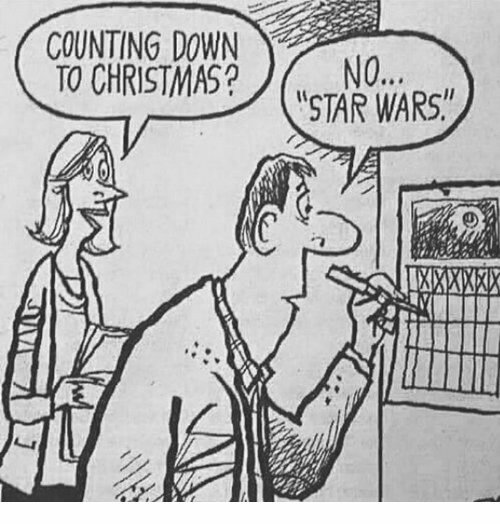 Keep ur weird agendas out of my star wars.